In the Pittsburgh Penguins’ early years, starting in the late 1960s, it wasn’t uncommon to buy a $5 ticket for a seat at the top of the Civic Arena (the “Igloo”) and at the end of the first period move to a seat in the first row behind the glass. Except for a few winning moments scattered through their first three decades, the idea of a full season sold-out arena was too farfetched, never mind the thought of a Stanley Cup. The only constant was that the Penguins were always in financial trouble and often threatening to move out of the Steel City. The 1983–84 campaign proved to be the season that turned everything around. The Penguins’ prize was Mario Lemieux, an 18-year-old center from Montreal, Quebec, who would lift the Pens out of the canyon of last-place finishes to the lofty heights of backto- back Stanley Cup championships in 1991 and 1992. Lemieux went on to become one of the greatest players the game had ever seen. He and teammates such as Jaromir Jagr, Tom Barrasso, Ron Francis, Joe Mullen, Kevin Stevens, Larry Murphy, and Paul Coffey soon made the Civic Arena the place to be. Though the Penguins’ front office tried to keep the star-studded team together, the franchise experienced financial troubles again, leading to threats that the Penguins would be sold and leave town. In 1999 Mario Lemieux, now in his 30s, headed a group that purchased the club. The new ownership began a renaissance in which players like Sidney Crosby, Evgeni Malkin, Marc-Andre Fleury, Kris Letang, and Jordan Staal again made the Pens a powerhouse on the ice, led them to a third Stanley Cup championship in 2009, and secured one of the best new buildings in the NHL: the Consol Energy Center. 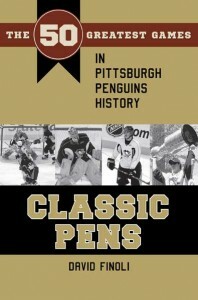 In Classic Pens, author David Finoli’s tour of the best moments in the Penguins’ long history will evoke special memories from longtime fans and delight those who currently follow the team. AuthorDavid Finoli is an author and sports historian who has written 16 books, mostly dealing with the history of sports in Western Pennsylvania, including two previous titles published by the Kent State University Press, Classic Bucs (2013) and Classic Steelers (2014). He is also a contributor to various books, magazines, and sports websites. Originally from Greensburg, Pennsylvania, Finoli lives in nearby Monroeville with his wife Vivian and children Cara, Matt, and Tony.